I cleaned out the rutabagas and turnips today. I had puchased a "light turnip" plate for my push planter last fall and it worked out well. I made the biggest roots ever on my turnips and rutabagas. I have sprayed, harrowed and leveled my corn patch. I am planting corn and okra tomorrow. Are you sure someone didn't lose a bowling ball in your garden? Wow, that's a nice crop; the soil must be perfect for rutabagas. Wow a giant! Funny but there are (were?) rutabagas growing in the oddest places at Ft Adams. The only thing that make sense is when they hydroseeded after the 'big haircut' last year there was some seeds in the mix. Wish I had taken a couple of pictures. The first few I saw I figured were from a stray food fight or something. They were just growing wild? Are you sure Bob Perry didn't get hold of that photo before you posted it? Yep, strangest thing. Inside the fort (6 1/2 acres) there is a slope that goes down to the outer wall (curtain) with 3 levels of guns, there was rutabagas on that slope (had mesh and been hydroseeded). Also in the far back of the outer works where I was mowing with the DR (ready for the Cub this year) there were several big ones.... no real farms nearby. No one can make any sense of it, so I can only guess they were in the hyrdroseed?? I will poke around and see if I took any pictures. One of the volunteers took one home and cooked it up, said it was good. Barnyard wrote: Are you sure Bob Perry didn't get hold of that photo before you posted it? No Bill, it is a wonder though. He probably has not seen it yet. Buzzard Wing wrote: Yep, strangest thing. Inside the fort (6 1/2 acres) there is a slope that goes down to the outer wall (curtain) with 3 levels of guns, there was rutabagas on that slope (had mesh and been hydroseeded). Also in the far back of the outer works where I was mowing with the DR (ready for the Cub this year) there were several big ones.... no real farms nearby. No one can make any sense of it, so I can only guess they were in the hyrdroseed?? I will poke around and see if I took any pictures. One of the volunteers took one home and cooked it up, said it was good. That is interesting. They had to have been mixed in with the other seed??? Show off and a pretty girl to help you. Just hope they taste as good as they look. That is a whopper Tim. What brand push planter do you use? It is the one made by Earthway, the one with the red seed hopper. I have had it for years. The key has been the "light turnip" plate that I purchased at Alf's Farm and Garden in Donalsonville. It plants the rutabagas and the turnips thin enough so they can have room to grow the larger roots. Looking good, how do you like to eat them? 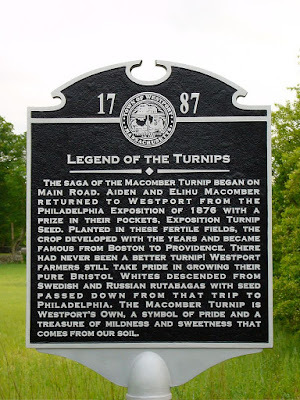 I grew up on a locally grown turnip/rutabaga cross that we would cook mashed with carrot. So possibly the seeds came over on the wind from Westport?? I know they are white on the inside (ran one or two through the DR 'food processor'). But I have never eaten one except with dinner in Quebec, so not real sure of the identification.... are they reddish on the outside like TEZELL's in the picture? Seems that small area of the world is good at plaques that memorialize farming advances.... Not far across the state line is the 'chicken memorial' for the world famous RI red. 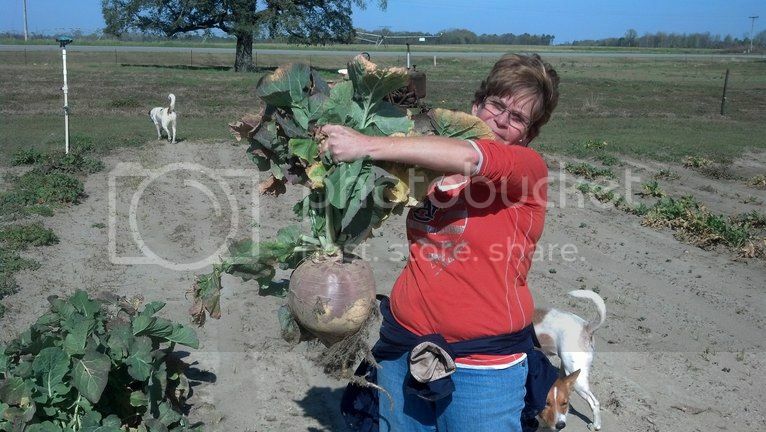 I think I could only fit about 3 of those giant rutabagas in my garden..... Such is life in the big city. Tim, I need to get a push seeder, have been thinking about it too long. Are you happy with it, can you give me a brief review on any pros or cons? We peel em, cut them up, add a little salt,grease,sugar, a little bacon and boil them until they are tender. Sometimes we cook just the root and sometime we add a few of the tops to them. They are one of my favorite veggies . Down here we put them in the bottom of the fridge for a week or so and it seems to make them sweeter. Where you are, they would be growing in the fridge already, I quess. Not to far from here in the town of Enterprise Alabama, we have a monument and a plaque devoted to a boll wievel! They are yellow to an light orange color inside. Last edited by Tezell on Sat Mar 16, 2013 7:41 pm, edited 1 time in total.